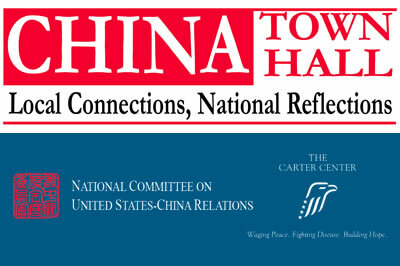 The National Committee is pleased to present this program, which will feature a live webcast with Jimmy Carter, 39th president of the United States, as part of the Conversations at The Carter Center speaker series, followed by local presentations from on-site China specialists addressing topics of particular interest to the community. China’s rapid development and Sino-American relations have a direct impact on the lives of just about everyone in the United States. CHINA Town Hall: Local Connections, National Reflections, is a national day of programming designed to provide Americans across the United States and beyond the opportunity to discuss these issues with leading experts. The eighth annual CHINA Town Hall will be held on October 16, 2014. The National Committee is pleased to present this program, which will feature a live webcast with Jimmy Carter, 39th president of the United States, as part of the Conversations at The Carter Center speaker series, followed by local presentations from on-site China specialists addressing topics of particular interest to the community. Each program is co-sponsored by the National Committee and a local organization. CHINA Town Hall is generously underwritten by the Starr Foundation. The webcast with President Carter will be live-streamed on this page at 7:00 p.m. on October 16. Jimmy Carter (James Earl Carter, Jr.), 39th president of the United States, was born on October 1, 1924, in the small farming town of Plains, Ga., and grew up in nearby Archery. His father was a farmer and businessman and his mother was a registered nurse. He was educated in the public schools of Plains, and attended Georgia Southwestern College and the Georgia Institute of Technology before graduating from the United States Naval Academy in 1946. He became a submariner, serving in both the Atlantic and Pacific fleets and rising to the rank of lieutenant. Chosen for the nuclear submarine program, he studied reactor technology and nuclear physics at Union College in Schenectady, NY, and served as senior officer of the pre-commissioning crew of the Seawolf, the second nuclear submarine. On July 7, 1946, he married Rosalynn Smith of Plains. After his father died in 1953, he resigned his naval commission and returned to Georgia. He took over the Carter farms, and he and Rosalynn operated Carter’s Warehouse, a general-purpose seed and farm supply company in Plains. He served on county boards supervising education, the hospital authority, and the library. In 1962 he won election to the Georgia Senate. He lost his first gubernatorial campaign in 1966, but won the next election, becoming Georgia’s 76th governor in January 1971. In December 1974, he announced his candidacy for president of the United States, and was elected president on November 2, 1976. He counts among his administration’s significant foreign policy accomplishments the Panama Canal treaties, the Camp David Accords, the peace treaty between Egypt and Israel, the SALT II treaty with the Soviet Union, and the establishment of U.S. diplomatic relations with the People’s Republic of China. He championed human rights throughout the world. On the domestic side, the administration’s achievements included a comprehensive energy program conducted by a new Department of Energy; deregulation in energy, transportation, communications, and finance; major educational programs under a new Department of Education; and major environmental protection legislation, including the Alaska National Interest Lands Conservation Act. In 1982, President Carter became University Distinguished Professor at Emory University in Atlanta, and founded The Carter Center to address national and international public policy issues, working to resolve conflict, promote democracy, protect human rights, and prevent disease. The permanent facilities of The Carter Presidential Center were dedicated in October 1986, and include the Jimmy Carter Library and Museum, administered by the National Archives. President Carter is the author of 28 books, most recently, A Call to Action: Women, Religion, Violence, and Power, published in April 2014.